The chants haunt visitors till long after they step out of Sakya Home. 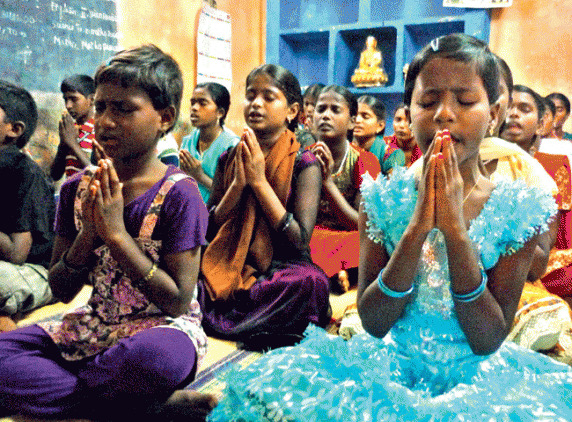 Lord Buddha seems to come alive at this modest quarters for about 50 orphaned children as they begin the day chanting, ?Buddham Saranam Gatchami, Dharmam Saranam Gatchami, Sangam Saranam Gatchami?. The children, victims of the 2004 tsunami, find a safe haven in the home in Vichur, Manali, in north Chennai, started by 32-year-old BA graduate Jaya Sreedhar. ?I had an urge to help these children. I brought groups of children from different districts to this house with the help of my friends. My family, four brothers, and I started this home and intially just provided three meals a day to the children,? recounts Sreedhar. There were days when the children, who had lost their parents or were disowned by their families, would cry at night. ?I would console them and asked them to call me Anna. I served them food and sent them to government schools, explaining the importance of education. Now many do not want to leave Chennai leaving us here,? says Sreedhar. ?During exam days, Akka and Anna stay with us all the time, providing tea and encouraging us,? said E. Elayaraja, 22, a final year B.Com student, who has been raised here since he was a teen. Sakya Home is supported only by individual donors. Sreedhar?s wife Nancy said they accept donations only in the form of rice, vegetables, books and scholarships for the children. Three inmates from the home are studying engineering; two are studying nursing and one graduate has gone to Tata Institute of Social Sciences in Mumbai for her masters in social work. The people of the area appreciate the work being done by the couple and show it in their own way. ?Vegetable vendor Raja Perumal, milkman Veera Perumal and provision store owner Balan collect their bills only once in three months. They are well aware of our problems and support us,? said the couple. Touched by the gesture of the couple, teacher Hevin Subaja, 26, who works in a nearby private school, decided to help the children with tuitions. ?I stay with the children like their elder sister and teach them spoken English,? says Subaja, who migrated from Kanyakumari. Some people in Birmingham, England, have also heard of Sakya through a professor in Chennai and came down and spent a day here, bringing cheer to the couple. To cheer up Sreedhar, call him at: 9080651393.